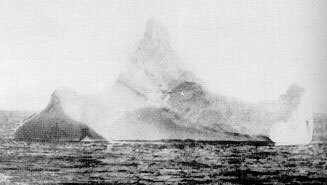 On April 15, 1912, the German liner Prinze Adelbert was steaming through the North Atlantic when its chief steward noticed an iceberg with a curious scar bearing red paint. He took this photo. He learned only later that the Titanic had gone down in those waters less than 12 hours earlier.